Wu Zhenglong, governor of Jiangsu, met Tuesday morning in Nanjing with Dr Nicole Hoffmeister-Kraut, Minister for Economic Affairs for Baden-Württemberg, Germany. Hoffmeister-Kraut is visiting Jiangsu for the celebration of the 25th anniversary of the twinned relationship between Jiangsu and Baden-Württemberg. Wu Zhenglong welcomed the arrival of Hoffmeister-Kraut and her party in Jiangsu for the celebration of the 25th anniversary of the twinned relationship. He said that he was very happy to meet with the minister again by recalling his visit to Hoffmeister-Kraut last September when he had an in-depth exchange with Hoffmeister-Kraut in Stuttgart and reached consensus on the cooperation between the two sides. In the past five months, the two sides have maintained close exchanges with cooperation projects promoted and made fruitful, Wu said, adding that the visit to Jiangsu by the Minister this time, which is of high level and large scale, will definitely promote the development of friendly relations between the two sides. The Governor noted that Jiangsu is willing to take the 25th anniversary of the twinned relationship as a new starting point, consolidate the foundation of cooperation, expand new space for cooperation, deepen the cooperation in the fields of Belt and Road, technological innovation, intelligent manufacturing, and people-to-people exchanges, give full play to the exchanges and cooperation between the two sides to make it of higher quality and higher level and work together to write a new chapter of cooperation for win-win. 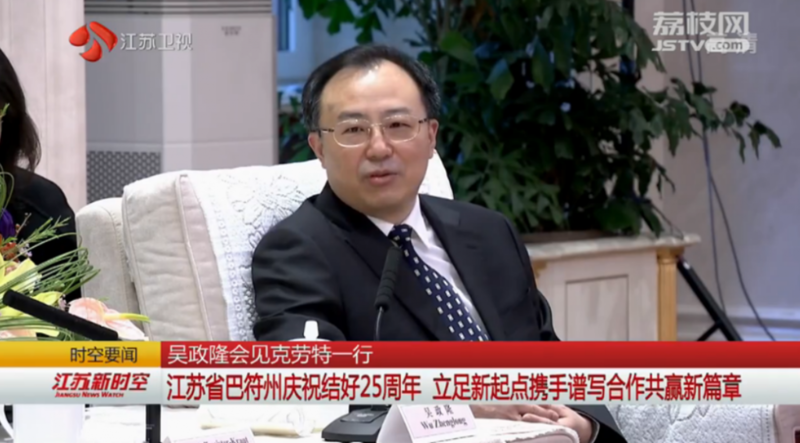 Wu Zhenglong pledged that Jiangsu will continue to create a stable, fair, transparent and predictable business environment, actively help companies solve problems and enable more German-owned enterprises to grow and develop in Jiangsu. Hoffmeister-Kraut said that Baden-Württemberg cherishes the profound friendship with Jiangsu Province. She hoped that the 25th anniversary of the twinned relationship will serve as a new starting point for both sides to continue to deepen exchanges and cooperation in various fields, achieve mutual benefit and common development, and promote friendly exchanges and achieve more fruitful results. Mr. Weber, Representative of the State of Baden-Wuerttemberg in China, accompanied the Minister to attend the meeting.